Since "Trend Analysis" is one of the most common top-line univariate analysis new analysts are often tasked with, I am going to use this example to demonstrate why such Champions ("Champ Analysis") must be challenged with “Challenger Analysis" or “Challenger Modeling.” I have devoted this post to the Champ and Challenger Analysis, deferring the Challenger Modeling to a future post. 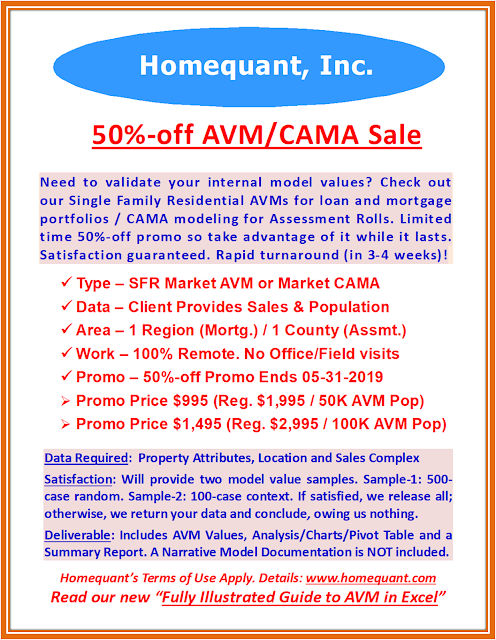 Champ Analysis: Many trade/research organizations and government agencies publish the Monthly Median Sale Prices for pre-owned and new homes. As a result, these Monthly Median Analyses have become the industry standard, prompting analysts to put together graphs, etc. to show the market trend. If they are not seasonally adjusted (generally they aren't, except Case-Shiller), M-O-M is less meaningful. If the series is extended, Y-O-Y (Jan-17 vs. Jan-18 or Q1-17 vs. Q1-18) is more meaningful as they are (sort of) seasonally adjusted. If you have to show such unchallenged trend(s), at least make it emphatically clear to your bosses that the latter is more meaningful. In any case, no data-savvy boss will ever use an unchallenged study to take important business decisions. Challenger Analysis: Alternatively, if you have access to the Sale Price and Net Bldg SF (Living Area or Heated Area), build a Challenger analysis to produce a normalized trend. Remember, it has to be organic, meaning the monthly stats must come from the variable SPSF (Sale Price divided by Bldg SF). Do not just divide the Monthly Median Sale Price by Monthly Median Bldg SF as they are mutually exclusive. Now, use this trend to challenge the Champ. Caution: before running the stats on SPSF, make sure there is no structural shift in the monthly median Bldg SFs. They must be well within a normal margin of error (say 5%) of the overall median. For instance, if the overall median is 2,000 SF, all monthly medians must be within that +/- 5% range. 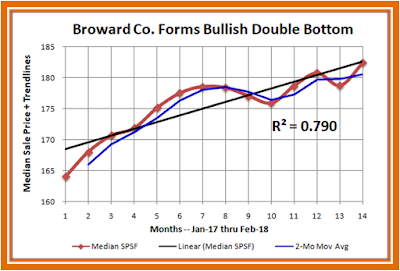 If you notice the tail end of the curve has been steadily shrinking (say around 1,650 SFs), make adjustments for the variances before challenging and highlight the point in your write-up, proving that you are well aware of the on-going change in the demand pattern. Now, take a look at the Broward County graphs. While the Champ (top chart) shows a bearish double top, the normalized Challenger trend (bottom chart) is almost diametrically opposite. Instead of a bearish double top, it shows an extremely bullish upsloping double bottom, even eclipsing the prior high of $180/SF. 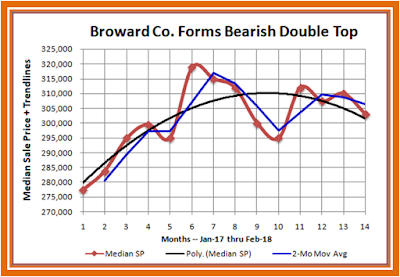 Read my prior "Broward County" post for an in-depth analysis (see the link below). This analysis proves why a superficial top-line univariate trending – despite being the industry standard – is inadequate, particularly in taking informed business decisions. Better yet, present the Champ-Challenger Analysis with an expanded percentile curve, preferably between the 5th and 95th percentiles, thus ignoring the outliers (to having to manually validate the sales for this project). As you stack up the monthly percentile curves, any shift in the demand pattern will also stand out (the median alone won't show that). If you submit these two analyses side by side to your bosses, you will become a highly sought-after analyst - in no time!